It’s about a year now that I abstain from milk and milk products. As it has affected (positively) my wellbeing so dramatically, I strongly recommend to generalize the concept - It is worthwhile to search ones roadblocks for health, in situations where ones efforts to heal do not result in contentment. Losing weight is my personal issue of life (also my scientific field of study), so for years I eat “right” as well as smartly exercise daily, and yet it was milk abstinence that enabled the 17kg weight loss this year. In the chart below (my "excess kg") you may see that in the previous year I have lost 5 kg with the same exercise & diet but with milk and its products (cottage cheese and yogurts). 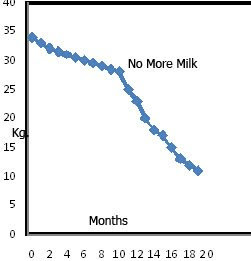 So milk abstinence enabled over 3 times faster weight loss. Pls note that the no-milk diet is not poorer in calories as instead I eat a lot of almonds which have higher caloric value. It has also (even before the weight loss was manifested) balanced my morning blood sugar levels (I am diabetic II) and now my HbA1c is balanced - 5.6 (it used to be 6.8 regardless of my very low carbohydrates consumption). One of my articles on obesity, defines 2 urges to eat - the need to eat as well as satiety, are regulated by these two unrelated urges. One urge is activated by our daily energy expenditure and the other by the need to accumulate energy for the future (activated by the degree of our bodily worry). I have also explained how satiety of the second urge is critical for a healthy weight loss. A US team indeed found levels of white blood cells were highest in men who were unfit and overweight. High levels of white blood cells can be a sign of inflammation/body worry. Indeed I’ve found that I show Lactose Intolerance and I guess this was a main body-worry which inhibited my health as well as my weight loss. It is intersting to note that in the ESHG 2009 meeting, a study demonstarted that the variant responsible for lactose intolerance among Europeans was also associated with higher BMI. But milk is not the only generator of worry, e.g. exposure to insecticide may cause such a worry and thus can play role in obesity… as well as other chemical exposures. Milk damage might not be related only to Lactose Intolerance, e.g. it was shown to be related to cancer progress via its N-glycolylneuraminic acid. 1- French study demonstrated increases in weight with high dairy calcium intakes in normal-weight women, and positive relations between milk consumption and waist circumference change in overweight women. 2- Milk products appear insulinotropic. 3- High intake of various food groups such as red meat, fried potatoes, cheese, and cottage cheese is associated with risk of type 2 diabetes. 4- In kids (age 9-14), dietary calcium and skim and 1% milk were associated with weight gain, but dairy fat was not. 5- Children in Crete with insulin-dependent diabetes mellitus, consumed more dairy products and less meats and cereals. 6- The majority of current evidence from clinical trials does not support the hypothesis that dairy consumption aids in weight or fat loss. 7- A family diet rich in dairy products during childhood is associated with a greater risk of colorectal cancer in adulthood. 8- The intake of dairy products may be associated with an increased risk of prostate cancer. 10- Cow's-Milk-Free Diet as a Therapeutic Option in Childhood Chronic Constipation. and last, milk may also help bacteria survive against low levels of antibiotics. Did you ever try the Paleo diet? Integrative scientist. 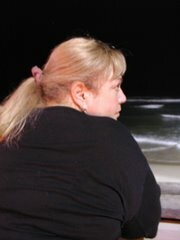 Major studied topics: wellness, stress and obesity. Love Tai Chi. The muscle – fat duel or why obese children are taller?